Women’s social advancement expands in various countries. In the 50 years since the founding of Unicharm, we have never wavered in our goal “to realize each person’s dream by providing products that physically and mentally relieve various burdens, from babies to senior citizens.” There have been significant changes in Japanese society in past 50 years. People’s lives have become filled with abundance, and women have advanced in society. 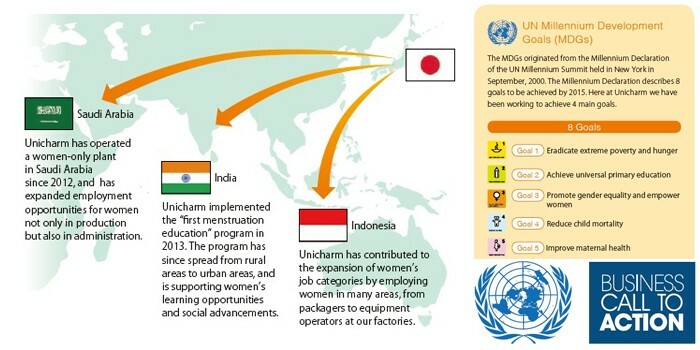 Unicharm has played a role in supporting the social advancement of Japanese women by providing feminine hygiene products with the goal of “transforming women’s discomfort to comfort.” We have been offering wide range of products, from disposable diapers for babies to products to assist caregivers, to relieve burdens women face in various aspects of their lives. We are proud that we have grown in harmony with the progress of Japanese society, and that we have been able to simultaneously contribute to its progress. Turning our eyes to the rest of the world, we can’t help but be concerned that a number of countries in Asia and the Middle East are still working towards development. In October 2012, Unicharm’s business activities providing baby-care and feminine-care products in the Middle East/North Africa and Asian regions was recognized as a project responding the Business Call to Action (BCtA) initiative of the UNDP. Our contributions are expected to improve the lives of 36 million women in these areas. Based on the know-how we have acquired through our activities in Japan, we will promote the empowerment of women in developing countries by providing products, services, and employment opportunities through careful consideration to the specific characteristics of each region or country. A global initiative established in 2008, Business Call to Action (BCtA) aims to achieve the UN Millennium Development Goals through the core business of private companies. In collaboration with local international development agencies in each country, the United Nations Development Programme (UNDP) has implemented a support program to aid in the construction of business models that provide both social benefits for the developing countries as well as commercial benefits for the companies operating there.